Debugging is big part of game development. If you think about “what is the quickest way to fix a bug in my system?” during development you will end up with tools helping you quickly target a bug and fix it. All of these examples can be achieved in Unreal Engine 4. I’m not a programmer so I won’t show you how to do such things BUT I will show you small example that everyone can do. I will create a component that can be attached to any actor and will display variables values that you want. 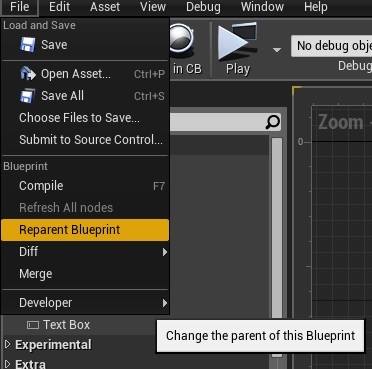 This way you don’t need to put Print nodes in Blueprints to check the variable state. You will be able to see content of all kind of variables. I will use some knowledge from get/set variables tutorial. First of all we will create custom structure to store the variable name and value which can be used in ShowDebugWidget. ShowDebugWidget will be custom UMG Widget class that will have one event to pass the data to Blueprint. Actual hearth of this system will be ShowDebugComponent – simple Actor Component that can be stored in any Actor. It will create and add Widget Component to the Owner and pass ShowDebugWidget class into it. Normally this could be stored in TMap but Blueprints can’t extend TMaps yet. I will use structure with the name of variable and its content as String. This is how we will store the data. Value is String as it will be displayed in UMG. It’s needed as we need to create custom event that will drive variables data to the widget. Now open the editor and add new C++ Class extending from UserWidget named ShowDebugWidget. We will create an custom event to pass the variables to the Bluprints. You can read more about exposing events to Blueprints here. We are declaring OnVariablesUpdated event which will pass DebugVariable array. //C++ implementation is empty. Proper implementation should be in Blueprints as it is more about layout. We won’t use C++ implementation of this function as UMG Designer is better for creating layout using these variables. That’s all in this Widget. Now let’s move to UI_MainShowDebugVariables. It shouldn’t have Canvas Panel as well so please delete it. Next add VerticalBox (it should be the root) and mark it as variable so you can see it in Graph. Yes, it’s our custom event! As this widget was reparented to ShowDebugWidget we can now add this event to the graph! It should be self explanatory. We are just adding Widget_DebugVariableWithName to the vertical box for each item that comes from OnVariablesUpdate event. That’s all here! Now the hearth. Create new C++ class extending from ActorComponent named ShowDebugComponent. * With this component you can add WidgetComponent drawing list of variables. USE THIS ONLY WHEN DEBUGGING as it 2ms per each component! Let’s stop on some of the file. In this FName array we will be able to add names of variables that we would like to debug. // With this component you can add WidgetComponent drawing list of variables. USE THIS ONLY WHEN DEBUGGING as it's 2ms per each component! //Add created component to the Owner. //If UserWidget (UShowDebugWidget) is created call OnVariablesUpdated event so it can be managed in Blueprints to fill the data in layout. Prop->ExportTextItem(VariableToString, Value, NULL, NULL, 0); // this function will export the value to string! Constructor is used to set the default values. After that I’m storing the reference so I will be able to call our custom event in Tick. Just calling our OnVariablesUpdated custom event using UpdateVariables() function which is returning array of FDebugVariable structure. This is the most important part of this tutorial. This function is searching for UProperty (variable) by name and export its value as String! Now if you compile you can create simple test. It’s so easy! Hope it will be helpful for you guys! Next PostNext Final Book should cover only Blueprints?